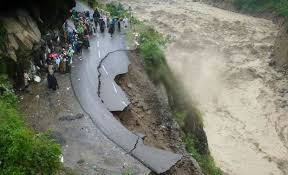 It was during one of the breaks (more frequent than work, I must confess) that I watched in horror the extent of devastation by floodwaters in Northern India. Though I was born and brought up in the southern part of the country and has spent most of my lifetime here, I have had the good fortune of spending a few years up north as well. So, as my fellow Malayalis were actively discussing the 'solar issues' (for the uninitiated, it is a scam that has created more heat in Kerala than even the sun could in this monsoon season! ), I couldn't help worrying more about my compatriots who were unfortunate enough to be caught in the cloud burst and flash floods. As the flood intensified, I watched in disbelief the buildings collapsing like a pack of cards (literally)! As they tumbled one after another and the strong currents of the river carried them away, all I could do was feel helpless and dumbstruck! I remembered that it was only the other day that a friend had posted a picture of himself on the Ghats of Haridwar, enjoying the serenity of the Holy Ganges. I was worried for him and his family. 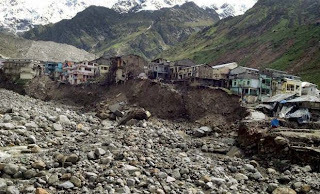 I was also worried for the thousands of people who was washed away, trapped or stranded. It did not matter that I know none of them. However, I could suddenly feel that I am nothing but a small worm in this vast universe. Here is humankind, who repeatedly boasts of having won over everything on earth. 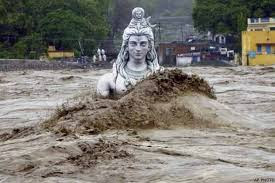 And it takes only a nano second for the nature to prove us wrong - and we are left clueless how to tackle the situation. The more I think of it, the more I realize how insignificant I am in this grand scheme of universe! 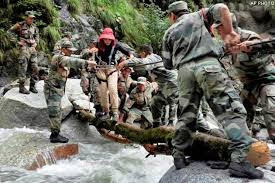 And what followed was the usual dramas - politicians playing dirty games for political mileages, media competing with each other to bring us the real story from ground zero, respective state governments demanding their citizens be rescued, doling out of inconsequential compensations and the like. The only people whom the country looked up to were - thankfully - our armed forces. Stories of selfless services and courage poured out from the disaster zone and once again, the nation bowed in respect and gratitude to its guardian angels. And my heart goes out of all those people who have suffered losses that are beyond words. Losing one’s near and ones, house, livelihood and all that matters in a wink is something that takes a lot of time to get used to – for anyone. Perhaps the scar of this tragedy would live forever – both in the minds of the victims and in the places where the flood created a havoc. Thousands are suffering and we are told that the real impact of the disaster is yet unknown. The channels and other media are full of discussions and some blame games are already on. It is being said that the impact of this disaster was more due to insensitive actions of ours. 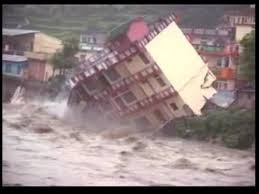 Due to our greed and shortsightedness, we have created ecological imbalances that even a small rain and a swelling river bring nightmares to us. People have already aligned themselves into different groups and are animatedly arguing for their cause – some say that for development we will have to sacrifice something; while the other says it is pure greed and apathy of people who matters that has created such a situation. All said and done, these endless debates will not make the wrongs right. It will not give us back what we have lost. The only thing we can do now is learn from our mistakes and take steps not to repeat them ever again. Let us not forget that there are generations to come after us, who have an equal right over the earth and its resources. Let us leave something for them as well. After all, when we are washed away in a flood, or are buried in an earthquake or are blown away by a tornado, we cannot take all the money and our belongings along with us. Also, while leaving this world forever, we cannot anything with us. So, why be selfish and create a hell on the earth? What is disheartening in this whole episode is the apathy with which common man is being treated. Stories are doing rounds that the instructions were to rescue VIPs first. 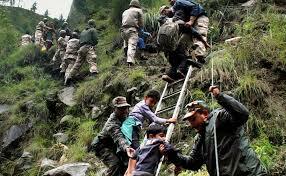 It is also being said that various states were demanding that the people from their state be rescued first. If such news are true, then that could be the worse than the disaster itself. For, a nation’s strength is derived from unity and not division. The day that we start thinking I am a Malayali, Tamilian, Kannadiga, Gujarati, Hariyanvi, Punjabi, Bengali and the like, the idea of India disappears from us. If we think along such narrow lines of divisional thoughts, the whole idea of India goes for a toss. Especially during tragic times like these, one need to rise above all such narrow mindedness and work together as a nation – we are Indians. Period. And while we all worried about the safety of the people from our states, we conveniently forgot about the locals. Thousands have lost their lives and many have been displaced. They will have to start their life anew, with the losses leaving a permanent scar in their lives. Kindly spare a thought for them as well. As the efforts are on for a mass burial of the dead, I hope that such a disaster will happen never again. Agreed, we cannot control the nature – but we can at least try to live in harmony with it. All said and done, if such disasters do strike again, we need to rise above all discrimination and work together as one nation. Perhaps it is the time to refresh our memories and remember one of the earliest lessons that we learned in school – Unity is Strength. Let us all unite for our country, especially when our compatriots need us. For all the selfless soldiers who are battling the odds, here is a BIG SALUTE!!! The entire nation is proud of you. Jai Jawan! Yes....you are right we have to learn from very disaster....but do we really do that.For sometime we keep discussing and then we tend to forget the resolutions we had taken till another disaster hits...... The simple example is in Tsunami 2004, it was seen that the areas which had mangrove forests, was less affected as in helped in reducing the thrust of those waves. When all our technologically high man made effects went for a toss,these plant species was found to be helpful. We all are busy clearing it where ever left, in the name of development....!